The options allow you to export data for manipulation in other programs, infographics for use in work products, and pdfs of data views, and more. If you want data you can manipulate using external software programs, there are several options: Excel, Delimited Text, SAS and XML. All of these options allow users to download the data into different programs (spreadsheets and a statistical software package) and manipulate it there. If you have used the Calculator feature to create formulas for additional data points, these data points are downloaded, as well. The option to download to a Shapefile allows users to export the map information to software that displays maps to ESRI requirements. 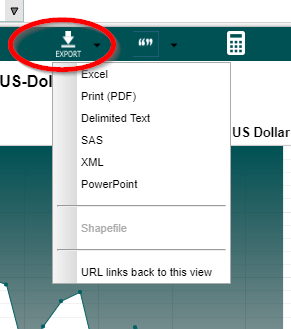 The PDF and PPT link exports the data visualization, data column list where displayed, and the statistical abstract describing the data view to a PDF or Powerpoint file. PDF exports are considered "DataSheets." 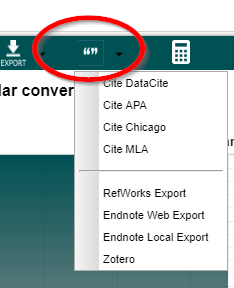 The “Cite This” icon, circled in red below, in the center tool bar of the Data Planet interface, provides options for direct export of citations formatted for several popular style guides, as well as options for export to citation management programs. Click on the Quotation Marks and select your preferred format. A dialog box will open with the formatted citation. “Copy to Clipboard” and then paste into your own document. As with all electronic reference management tools, do note that the final responsibility for the citation is yours - as the author of the paper - so be sure to review the citation created against the source style guide and/or consult faculty. 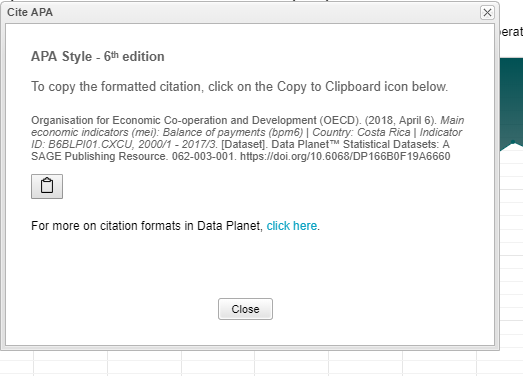 For more on Data Citation formats and exports in Data Planet, click here . Note that exports for reference manager software will require manual intervention to properly format for the style manual you are using.